hey hey! I've finally got some time off work which means time to actually get dressed in some proper clothes and even squeeze in a blog post or two. 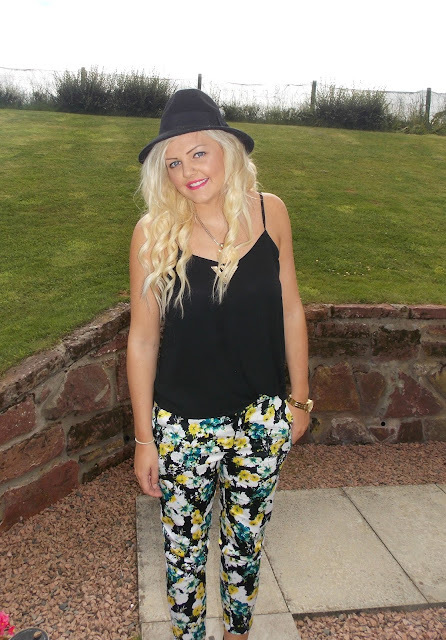 I wore this to a BBQ at my cousins house this Saturday, it was kinda cold so we ended up inside - typical scotland! I bought these Boohoo trousers waaay back in April and then they got lost at the back of my wardrobe alongside a million other things. I was having a hard time deciding what to wear (as usual! ), so when I came across these it made my day soo much easier - the bold and colourful print meant that a plain black top was enough to complete the outfit. I added my fedora hat to hide my roots because yet again they are horrendous! I also threw on my black and white platforms which I barely ever get the chance to out to play.